Capture the flavors of the season by substituting your favorite vegetables. I fall into the second response category. Shocker, right? Yet I find many people who previously didn’t enjoy tofu, or maybe just didn’t know how to make it taste good, enjoy the ingredient once someone has finessed the delicious from it. It’s an inexpensive protein source that is fully open to interpretation! Before marinating tofu, cut the tofu block in half through the thinnest side. Press tofu slabs between clean kitchen towels to remove excess moisture before marinating. Tofu is best served after ‘resting’ about 10 minutes either in the pan or from the oven. This recipe was adapted from Plenty by Yotam Ottolenghi. The original recipe calls for brussel sprouts and shiitake mushrooms, but I’ve altered the ingredients to reflect a summer variation. We first made this by the book (amazing!) but now that brussel sprouts aren’t in season, Lacinato (aka. dinosaur) kale was a fabulous stand-in. Play around with different mushrooms and vegetables to fit the season and your taste. Foodie Note: I usually don’t make Asian inspired dishes (because it’s typically a disaster!) so the initial ingredient list required an investment trip to the grocery store. Now that I’m stocked with sauces, it’s an easy weekday meal that requires only a few additional ingredients. 1) Press tofu to remove excess moisture (see Foodie Tips above). Cut the tofu into 3/4″ cubes. 3) Tear kale from the thick stem and put into a large bowl of water. With hands gently give kale a ‘rinse cycle’ like a washing machine. Let sit for 2 minutes as sand or dirt from the kale will settle to the bottom of the bowl. Remove kale without stirring up water too much and put into salad spinner. Spin to remove excess moisture. 4) In a large cast-iron pan, add 4 tablespoons sunflower/vegetable oil and heat to medium high. Once pan is hot (it should pop if you sprinkle water into it) add kale. Be careful, the oil will sputter. Season with salt, toss kale and lightly fry for about 4 minutes. Reduce temperature to medium, toss, cover with a lid and cook for an additional 5-8 minutes. You don’t want it be 100% cooked. Remove from pan and add to a medium sized bowl. 5) Add 2 more tablespoons sunflower/vegetable oil to the pan, heat to medium (do the water test again) and add green onions, chile and mushrooms. Cook 4-5 minutes until browned. 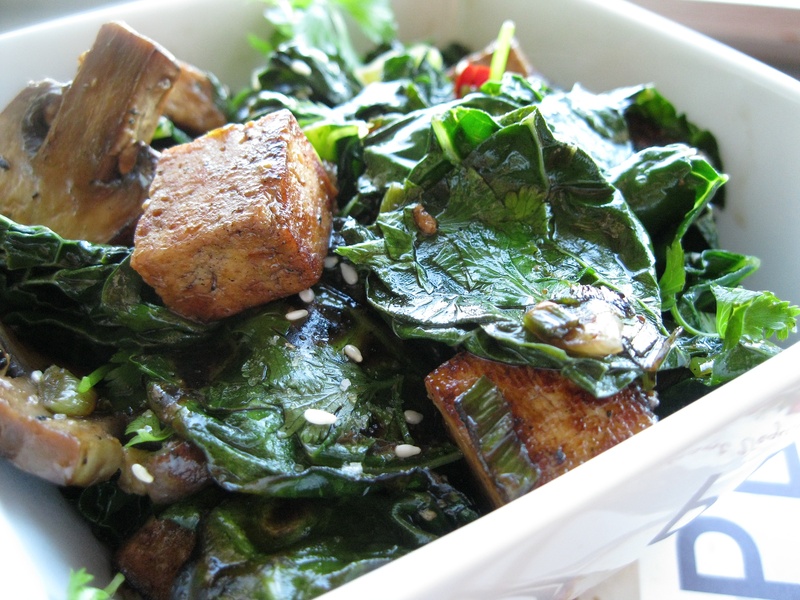 Transfer to kale bowl. 6) Turn pan to medium high, add 2 tablespoons sunflower/vegetable oil, use a spoon to lift tofu from marinade and into hot pan. Be careful, the pan will splatter again. Space the tofu pieces apart and in one layer. Reduce the heat to medium and saute until all sides are caramelized, 8-10 minutes. 7) Remove pan from heat. 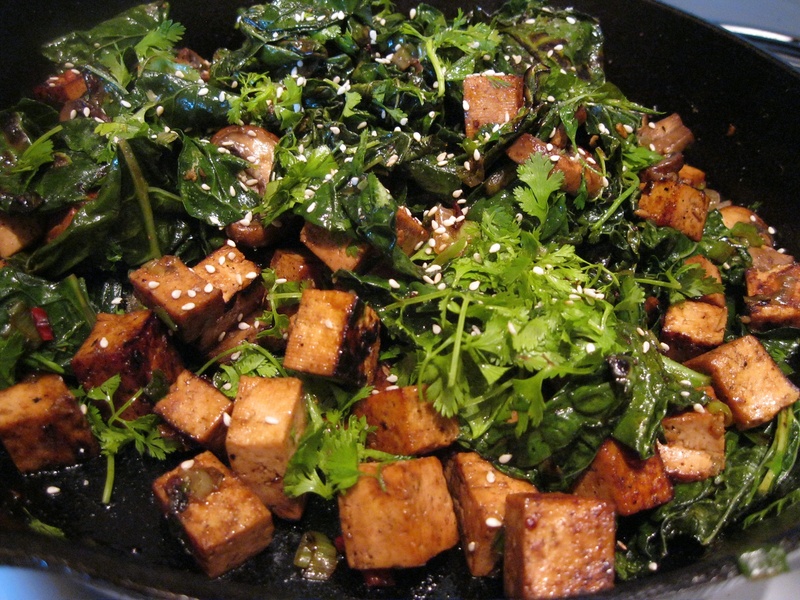 Add all ingredients in kale bowl to warm pan with tofu. Add the remaining tofu marinade and a 1/2 cup cilantro. Toss everything together and allow to cool slightly in the pan about 8 minutes. Taste, add salt if needed. Stir in the remaining sesame oil. Serve warm garnished with sesame seeds and the rest of the cilantro.